"AAMI Park" redirects here. For the former stadium in Adelaide, see Football Park. The Melbourne Rectangular Stadium, commercially known as AAMI Park, is an outdoor sports stadium on the site of Edwin Flack Field in the Sports and Entertainment Precinct in the Melbourne City Centre. The stadium's major tenants are NRL team Melbourne Storm, the Super Rugby team Melbourne Rebels, and the A-League teams Melbourne Victory FC and Melbourne City FC. AAMI Park became Melbourne's first large purpose-built rectangular stadium when completed in 2010. Referred to as Melbourne Rectangular Stadium during its construction, the ground was officially named AAMI Park on 16 March 2010, in an eight-year sponsorship deal with insurance firm AAMI. When the project to build the new stadium was approved, the largest stadiums in use were the Melbourne Cricket Ground (MCG) and Docklands Stadium. These were venues of oval configuration and best suited to Australian rules football or cricket. The previous largest rectangular stadium in the city, Olympic Park, was a repurposed track and field venue. The stadium was one of five venues for the 2015 AFC Asian Cup, hosting the opening match and six other matches including one Quarter-final game. AAMI Park hosted rugby league Four Nations matches in 2010 and 2014, and was used for the 2017 Rugby League World Cup. Olympic Park Stadium, Melbourne's main venue for soccer, rugby league and rugby union, could hold 18,500 people, but with only 11,000 seated. It had been the home ground of the Melbourne Storm since they entered the National Rugby League in 1998. The A-League's Melbourne Victory FC also used Olympic Park Stadium from 2005 to 2007 when they switched permanently to Docklands Stadium. In 2004, as part of Melbourne's bid for a Super Rugby team, the Victorian Government prepared an economic impact study on the development of a world class rectangular stadium in Melbourne. But in late 2004, the bid lost out to the Western Australian consortium, which would become the Western Force. On 6 April 2006 the Victorian Government announced that a $190 million 20,000-seat rectangular stadium would be built on the site of Edwin Flack Field and would be home to NRL team Melbourne Storm and A-League team Melbourne Victory. The stadium's planned capacity was increased to 30,000, with foundations capable of expansion to a capacity of 50,000 if needed. The stadium began construction in late 2007. In November 2009, when the Super Rugby competition expanded to 15 teams, the Melbourne consortium won the 15th Super Rugby licence, with the new franchise intending to play their games at the new stadium. On 23 November 2009 it was announced that the stadium's first match would be the 2010 ANZAC Test between the Australian and New Zealand rugby league teams on 7 May 2010. The stadium was referred to as Melbourne Rectangular Stadium, Swan Street Stadium or the Bubble Dome during its early construction. 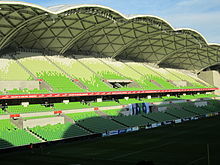 The stadium's commercial name was announced as AAMI Park on 16 March 2010 in an eight-year deal. The stadium held its first event, rugby league's 2010 ANZAC Test, on 7 May 2010. The opening ceremony featured the NRL's all-time highest point-scorer, Hazem El Masri, who had retired the previous season, kicking a goal. The first points scored on the ground were from a Jamie Lyon penalty kick in the 32nd minute, and the first try was scored by Brett Morris in the 39th minute. Australia defeated New Zealand 12–8 in front of a sell-out crowd (near 30,000). Two days later the first National Rugby League match was played at the stadium when the Brisbane Broncos defeated the Melbourne Storm in front of a crowd of 20,042. AAMI Park hosted international matches as part of the Rugby League Four Nations in 2010 and 2014, when Australia defeated England by 34–14 in front of 18,894 fans on 31 October 2010, and again when Australia defeated England by 16–12 on 2 November 2014 (attendance: 20,585). On 5 August 2010 the stadium played host to its first A-League match. It was also another first, as the newly formed Melbourne Heart FC played their first game in front of 11,050 fans against the Central Coast Mariners. The Heart lost 1–0, and Alex Wilkinson had the honour of scoring the first goal. The first Melbourne Victory match was played at AAMI Park v Perth Glory on 14 August 2010 in front of 21,193 fans. The venue hosted the 2015 AFC Asian Cup opening ceremony and seven international matches including the tournament opener between Australia and Kuwait on 9 January, and a quarter-final match South Korea and Uzbekistan on 22 January. The Melbourne Rebels played their first Super Rugby match at AAMI Park on 18 February 2011. The Melbourne Rising played their first National Rugby Championship match on 24 August 2014, defeating the North Harbour Rays by a resounding 55–34 score. The Rising played a semi-final at the stadium on 25 October 2014, but lost by 29–45 to the Perth Spirit. On 15–16 February 2014, AAMI Park hosted Bruce Springsteen and the E-Street Band for their High Hopes Album Tour. A surprise guest – Eddie Vedder (of Pearl Jam) – joined Bruce on stage opening the show with a cover of AC/DC's "Highway To Hell" then Springsteen's own "Darkness on the Edge of Town". To differentiate the Melbourne shows from the rest of the tour, Springsteen and the band played the entire Born in the USA album on 15 February (for the second time anywhere in the world). On 16 February, fans were treated to the entire Born to Run album. On 10–12 December 2015 AAMI Park hosted Taylor Swift as she brought The 1989 World Tour to Australia. Swift originally had one date for Melbourne, adding a second night quickly after the first night's pre-sale. Due to high demand, after her first two shows completely sold out, Swift announced a third record-breaking date to end her Australian leg of the tour. She played to a total of 98,136 fans over those three sold-out nights. The COX Architecture designed stadium features a "Bioframe" design, with a geodesic dome roof covering much of the seating area, while still allowing light through to the pitch. The northern and southern sides of the stadiums are called the Olympic Side and Yarra Side respectively. The exterior of the stadium is covered in thousands of LED lights which can be programmed to display a variety of patterns and images. The stadium includes training facilities and office accommodation for Melbourne Storm, Melbourne Victory, Melbourne Football Club, the Victorian Rugby Union, the Victorian Olympic Council, Olympic Park Sports Medicine Centre (OPSMC), Imaging@Olympic Park Radiology and Tennis Victoria. The stadium will be used by the Melbourne Demons as their administration headquarters. The team had wanted the stadium completed by 2008 to coincide with its 150th anniversary. It is planned to house public bars and cafes, 24 corporate boxes, a dining room with a capacity of 1000 people, a gym and lap pool. The stadium was initially proposed to have a seating capacity of 20,000, upgradeable to 25,000. This was due to both expected demand, as well as a state government agreement with Docklands Stadium that no stadiums with a capacity greater than 30,000 would be constructed in Melbourne before 2010. These plans were revised after the Victory refused to commit to playing at a stadium of such small capacity, having achieved an average attendance of over 27,000 since their move to the Docklands Stadium in the 2006–07 A-League Season. Alternative plans put forward by the Victorian Government proposed a capacity of 30,050, on the condition that the Victory sign on as a tenant. An agreement was reached and the stadium went ahead at this capacity. To assist with the extended capacity, temporary stands can be erected behind the goals during soccer matches and removed during rugby league and union games so as to allow space for the in-goal area (an international soccer pitch measures 105 metres in length, while including the in-goal areas, rugby league and rugby union have a minimum field length of 112 and 120 metres respectively). Although the stadium was built with foundations to allow for future expansion to 50,000, the roof was not designed with this in mind, and so the stadium cannot be expanded without major construction work. Construction of the stadium was featured during a 2010 episode of the TV show Build It Bigger. In June 2012 the stadium won the award for the most iconic and culturally significant stadium at the 2012 World Stadium Awards, held in Doha, Qatar. Panoramic view of the AAMI Park viewed from a city building. Panorama of AAMI Park during the 2015 A-League Grand Final between Melbourne Victory and Sydney FC. ^ Reed, Ron (8 May 2010). "Bubbling with excitement on opening night". Herald Sun. News. Retrieved 18 May 2010. ^ "Capacity crowd tipped for opening Melbourne Rebels game". Herald Sun. News. 16 February 2011. Retrieved 16 February 2011. ^ "Melbourne Rectangular Stadium (AAMI Park)". Major Projects Victoria. Archived from the original on 24 January 2010. Retrieved 18 May 2010. ^ a b c Gough, Paul (26 November 2009). "Anzac Test to open new stadium". Sportal. Australia: Sportal. Archived from the original on 9 May 2010. Retrieved 23 May 2010. ^ a b McMahon, Stephen (16 March 2010). "Lucky new stadium's called AAMI". Herald Sun. News. Retrieved 18 May 2010. ^ "A-League 2010/11 Season Draw" (PDF). A-League. Archived from the original (PDF) on 1 June 2010. Retrieved 2010-05-18. ^ "AAMI Park". Austadiums. Retrieved 18 May 2010. ^ "Video: Melbourne's field of dreams". Moreland Leader. News. 26 April 2010. Archived from the original on 1 May 2010. Retrieved 23 May 2010. ^ Ormond, Aidan (19 April 2010). "Heart: Deal Or No Deal?". Four Four Two. Australia: Haymarket. Archived from the original on 22 April 2010. Retrieved 2010-05-10. ^ Read, Brent (8 May 2010). "Kangaroos shine brightest against New Zealand". Australian. News. Retrieved 11 May 2010. ^ Press Association (7 May 2010). "Australian class sees off New Zealand as Brett Morris scores two tries". The Guardian. Retrieved 20 February 2014. ^ Barclay, Chris (8 May 2010). "Kangaroos composure denies Kiwis". The New Zealand Herald. Retrieved 20 February 2014. ^ Howes, Jack (24 August 2014). "NRC: North Harbour Rays v. Melbourne Rising Review". Green and Gold Rugby. Archived from the original on 24 August 2014. Retrieved 24 August 2014. ^ Mitchell, Peter (25 October 2014). "NRC Semi Final 2: Melbourne Rising Fall, Perth Spirit Soar". Green and Gold rugby. Archived from the original on 27 October 2014. Retrieved 27 October 2014. ^ "Venue gets first rock concert with Foos". HeraldSun.com.au. Retrieved 7 January 2018. ^ "Bruce Springsteen & The E Street Band - February 15, 2014 AAMI Park, Melbourne, AU". BruceSpringsteen.net. Retrieved 7 January 2018. ^ "Taylor Swift adds new Aussie show". News.com.au. Retrieved 7 January 2018. ^ Rolfe, Peter (2 August 2009). "Stadium of light". Herald Sun. News. Retrieved 22 May 2012. ^ "Melbourne to get 30,050-seat stadium". Australia: ABC. 23 May 2007. Archived from the original on 26 June 2007. ^ Rolfe, Peter (3 February 2008). "New ground may hold 50,000". Herald Sun. News Limited. Retrieved 24 February 2008. ^ "Grounds for concern". Age. Melbourne: Fairfax. 16 September 2009. Retrieved 18 September 2009. ^ "Current Boxscore". Billboard.com. Retrieved 7 January 2018. ^ "Ed Sheeran Breaks Venue Record". Billboard.com. Retrieved 7 January 2018. ^ "Current Boxscore". www.billboard.com. Archived from the original on 26 February 2014. Retrieved 26 February 2013. ^ "Sporting & Event History - AAMI Park". AAMIPark.com.au. Retrieved 7 January 2018. ^ "Bruce Springsteen and the E Street Band - AAMI Park". AAMIPark.com.au. Retrieved 7 January 2018. ^ Rugari, Vince. "England beat Wallabies 23-7 to claim historic Test series win at AAMI Park". Fox Sports Australia. News Corporation. Retrieved 19 June 2016. ^ Ward, Roy. "Wallabies v England: AAMI Park surface causes concern again as rugby scrums lose grip". Sydney Morning Herald. Fairfax Media. Retrieved 19 June 2016. ^ Dan Colasimone (17 May 2015). "Melbourne Victory claim A-League title over Sydney FC thanks to Besart Berisha, Kosta Barbarouses and Leigh Broxham strikes". ABC News. ^ "Crowd roars for new star". HeraldSun.com.au. Retrieved 7 January 2018. ^ "NRL finals 2015: North Queensland Cowboys through to grand final as Melbourne Storm fail". Sydney Morning Herald. Fairfax Media. Retrieved 26 September 2015. ^ "Marika Koroibete punch costs Melbourne Storm big in preliminary final loss to Cowboys". Fox Sports. News Corporation. Retrieved 26 September 2015. ^ AAP (25 April 2014). "New Zealand Warriors beat the Melbourne Storm 16–10 at AAMI Park on Anzac Day". ABC News. ^ "RaboDirect Rebels go down to British & Irish Lions" (Press release). Melbourne Rebels. 25 June 2013. Archived from the original on 30 June 2013. Retrieved 2013-06-25. ^ Ferguson, Shawn Dollin and Andrew. "Melbourne Rectangular Stadium - Melbourne Rectangular Stadium - Rugby League Project". www.RugbyLeagueProject.org. Retrieved 7 January 2018. ^ "Melbourne Rectangular Stadium (AAMI Park) – Our past projects – Our projects – Major Projects Victoria". Majorprojects.vic.gov.au. Retrieved 13 July 2012. Wikimedia Commons has media related to Melbourne Rectangular Stadium. This page was last edited on 26 March 2019, at 06:46 (UTC).